Ivory Dressing Gown / Robe / Kimono. 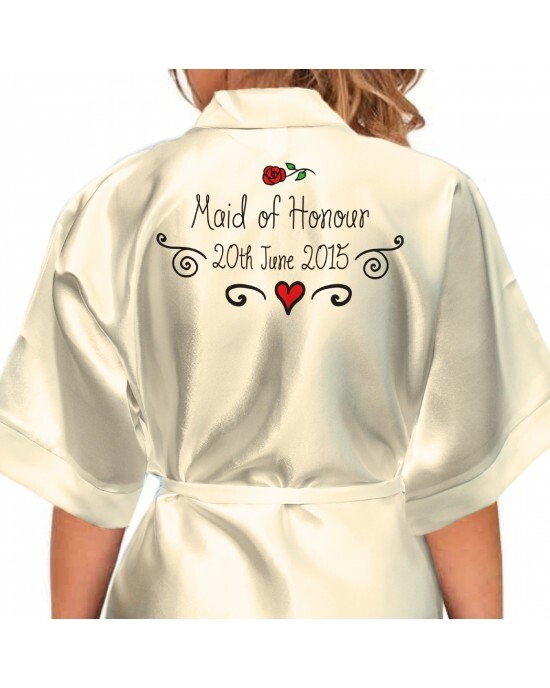 This beautiful wedding morning robe has an unusual hand drawn design with a red rose and some scrolls to decorate. The font chosen also compliments the design elements. 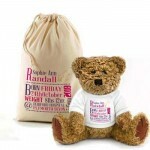 Perfect Item for your / her special day. 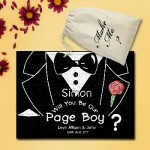 You may be buying this as a gift or for your self buy this is sure to enhance you wedding morning, get ready to rock those wedding photos !.... Look glamorous and gorgeous in whilst getting ready for your big day. Have fabulously fun photos of your morning with these beautiful satin gowns personalised, printed with your wedding details. 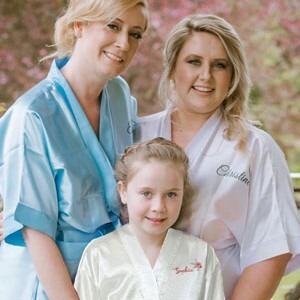 These luxury Soft Satin Polyester Robes have a luxurious feel and a beautifully printed image and, or text on the front & back, with a tie belt of the same material, offers a fabulous nipped-in waist while the three quarter length gives an air of luxurious elegance whilst being decently dress all morning. Each Robe will come with the design you choose from the main picture above. They're machine washable and wash up beautifully. You can iron / steam them without a problem. 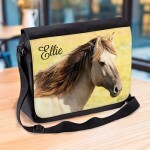 Red Roses Make Up Bag Personalised / Cosmetic Bag Perfect Gift Idea for Her. Favours Birthdays Christmas. 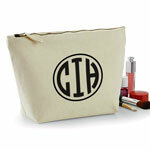 Pencil / Make-Up Case.A robust case for daily use. The front panel is held down by Velcro strips, with zip compartments under the front flap.M..
Ivory Dressing Gown / Robe / Kimono.A large water colour heart decorates this robe, the text is highlighted to contract the colours.Perfect Item for y..
Ivory Dressing Gown / Robe / Kimono.This personalised satin wedding robe has a realistic wedding ring design making the centre of the design, with the..
Ivory Dressing Gown / Robe / Kimono.Perfect Item for Your/ Her Special day Bride/Mother of the Bride/Groom Maid of Honour/Bridesmaids OR A Perfe..
Ivory Dressing Gown / Robe / Kimono.A very pretty water colour design, featuring a beautiful bouquet of flowers in the same water colour style making ..
Ivory Dressing Gown / Robe / Kimono.A very ornate and intricate scroll design is perfect to decorate this special gown. 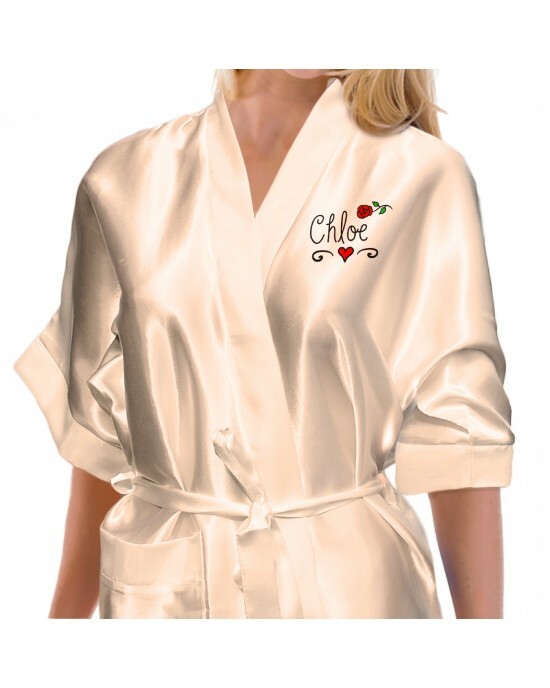 This design can be p..
Children's, Kids Personalised Satin Robe. Hand Drawn Rose and Scrolls Design. Kids, Satin Dressing Gown / Robe / Kimono.A unusual hand drawn rose and scroll design is used to decorate this child size robe, to match the adult rob..